Touched to see young children begging on the side of the road. They were asking for mercy and sympathy from the community, and hoping to be given the opportunity to continue living. Mom and dad do not know where. Together with their peers or siblings, the reality of young children is begging from people in Jakarta is not foreign. This can be done by many citizens of Jakarta in order to survive. So long as writers think and try to analyze, why that's the way they choose to begging on the road? However, when trying to underlie their conscience, the answer is, that only the options they have. Being a beggar is not a good thing in the eyes of the public. Like the saying goes, the hand that gives is better than the hand that receives. The reality is, not everyone will be generous every day for providing aid. They grumble, complain and pry for the assistance rendered until it no longer appears sincere, and people prefer to just close their eyes, cover their ears and pretend not to see them. In fact, beggars also have dignity and self-esteem. Not everyone who is a begger, wants to be one. Thus, there are a few beggars who admit, they do not have the mental strength to face society. This fact is confirmed by a small boy, who was once spent his life in the street asking for public sympathy. Tegar Septian, the 13-year-old, born on September 18, 2001, realized he must work hard to bring his family out of poverty. 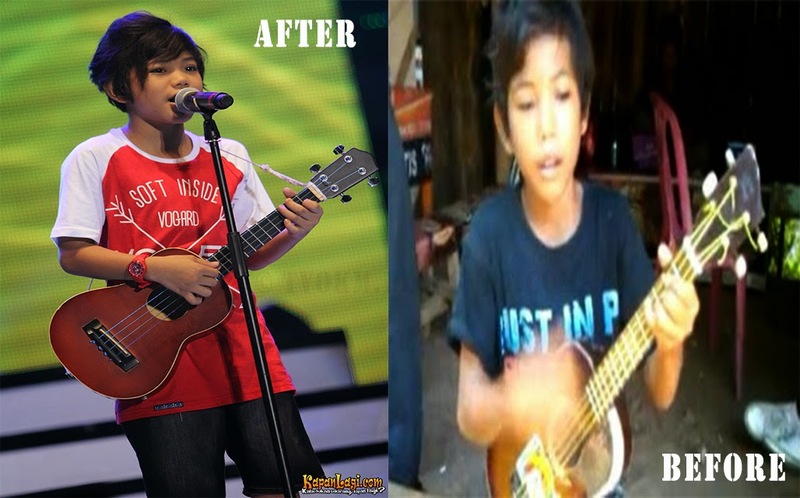 From a beggar, he is lifted up by the people of Indonesia as a young entertainer who has a bright future. If he lived on the in the street before, nobody probably cares anymore about that part of Tegar's life and today he can be proud, because of his popularity with Indonesia's leading artists. Tegar's song, Aku Yang Dulu (I was before) is becoming a commonly heard whistle from music fans in Indonesia. Tegar's stage is no longer on the edges of the road, in open cafés, on the bus or the train, and he can be proud to have received many invitations to perform. Aku Yang Dulu was produced specifically for Tegar because the song tells the story of the little boy's journey through life and makes the listener pay attention. However, not only is the popularity of Tegar important, instead, what is more important is he will be a role model to other children who want to change the fortunes of their family. The profits of being an artist yielded a decent result for Tegar. The income he received as a singer enabled him to provide for his family. Everything is affordable for Tegar. He can give his family members motorcycles and electronic equipment, such as iPads and mobile phones. He wants to prepare a home for his family in Cikampek (his hometown) soon. Based on a rough calculation, the income earned by Tegar as a singer is fairly lucrative for a kid like him. Every week he will earn between 6 million RP (RM 1,800) to 7 million RP (RM 2,180) so that he can make his family happy. As a new singer, Tegar does not need to know much about his music career's management because everything is handled by his manager. Despite the success and wealth he earns, Tegar is still humble because everything he did was to provide for his family and the people closest to him. At the age of 12, Tegar's initiative to work hard changed the fate of his family. His mother, Ratna Dwi Sisi, is very thankful and touched by the sacrifice of her eldest son for his four siblings. Ratna admitted, before Tegar became famous, they lived under primitive conditions and she could not afford to provide daily meals. Sadness and depression is everywhere in countryside where Ratna lives, and there was no one else to care for Tegar's familie. During the more difficult times, in order to her children's stomachs, Ratna and her children had to kneel to ask for food. Because of Ratna's family difficulties, Tegar had to leave school and the little boy had to take care of his three siblings that were still young. Perhaps, not willing to live in poverty, Tegar decided to get out of poverty by bringing himself up for several months. Tegar, with courage and persistence, began to approach a group of street children who made their living by begging. From there, he also approached music by singing practice and learned how to play musical instruments, including the piano and the flute. Due to uncontrolable issues from his family, other problems started to face Tegar when the lack of boundaries made him become wild and he started smoking cigarettes and sniffing glue. However, it was destined that Tegar would not live there. The advantages and great talents of the small child were discovered by Alfas Hermansyah and he offered to mentor the child be more 'civilized.' Alfas worked hard to develop Tegar's artistic talents until he ended up in the place he is today. He became famous and started making himself busy in order to fulfill the many invitations from outside Jakarta he had received. He also received an invitation perform on various television programs. Today, his family no longer lives in the village, but instead, they now enjoy a peaceful life in an apartment. The little boy named Tegar is really now an entertainer and his lifestyle reflects this, because wherever he goes, a luxury car will go with him (as well as with a number of personal assistants). A quick look at the pages of Tegar's history from his art career, shows that his fate really changed after he was called the champion in a singing contest in Subang, West Java, Indonesia. Success in the singing competition paved the way for the birth of a child of Pemalang to gain popularity. Tegar is no longer begging for food and money from the public in order to afford to a bowl of rice. In fact, Tegar does not even have to strum his own guitar or sing, because these days, background music is available or his show will be accompanied by professional musicians. Living on the streets caused his mind to be strengthened. He understands now that children should be educated. Although his life already luxurious, Tegar will not never forget his origins. He will always strive and pray for his singing career, so that it will last long and he able to continue living with his family.